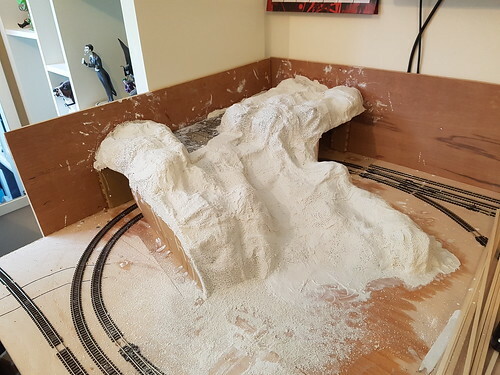 Pretty big update for my layout, first bit of real scenery has been started. Very happy with the results of my first time ever using this stuff. £1 a 15cm by 3m roll from Hobbycraft. 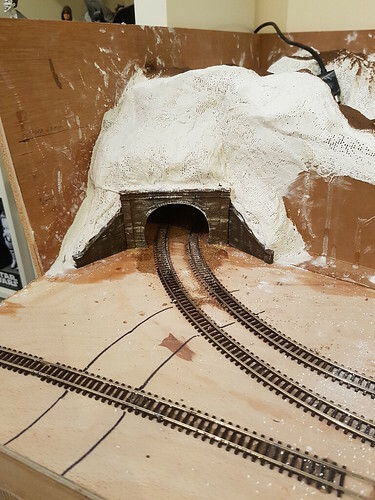 Anyway back to my layout, once its dry I'll be painting it and adding the tunnel portals and the small bits which are missing between where the portals will be as this is a fairly tall hillside relative to where the tunnels are. Not to put a damper on your parade Oncominstorm but is that tunnel removable or can you get access to the track underneath it for when the inevitable happens and a loco stalls, a carriage or wagon derails? 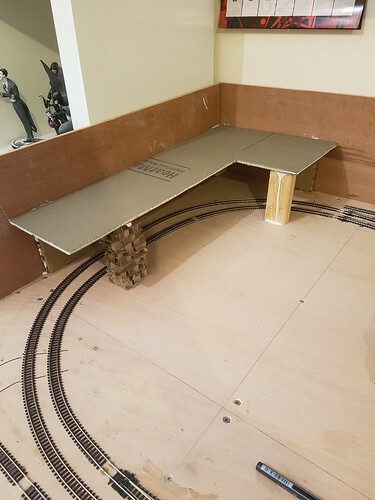 No damper, I just need to tell everyone that there is a cutout on the left of the layout, just a poor angle on my photo, it is hard to see with it being right up against the cabinet so no light is getting in. Tunnel portal now has rock face connected. Any touch ups I will do once the plaster cloth has dried and use filler to smooth edges as well. 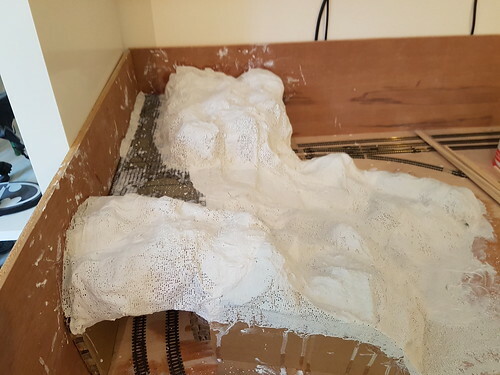 I had one slight mishap, once I removed the paper I was using to protect the track I found some runoff plaster cloth water or gunk had got onto the ballast and track in a big massive blob. I removed it and thankfully it only messed up the ballast between tracks not the rails themselves so I can remedy this. Tomorrow I will do some more work on the layout, possibly get the other end of the tunnel in near to where the station will be. More scenic work done today. 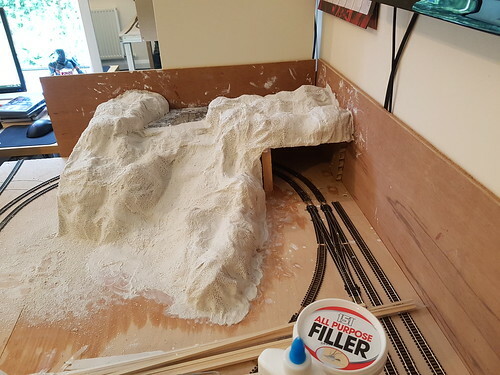 The white strip in the middle will become a road, the cliff to the left by the tunnel will be painted in a dark grey and with washes and such to highlight the crevices I have made in filler. I am going to be having a mini waterfall which leads into a culvert under the road and will have a small stream flowing by the side of the road, which will go into another culvert under the lower section of road and again under the double lines leading off the layout, this way I do not have to cut chunks out of my baseboard to build a bridge. I have posted this on the facebook page too, sorry if youve seen it twice but I know some people arent on the facebook page that are on here. The layout has had a new name chosen. Welcome to Oakford Hills. With the Oakford Station serving the town of Oakford. Looking good. I’ve just caught up from page one. Great progress so far. I’m looking forward to seeing scenics develop. I’m glad you cleared this up on page 3. Having only just found this thread I re-read your first post a few times as the naming part didn’t make sense. I have a newborn baby to contend with (4 days old) so I just assumed my brain wasn’t functioning although your later post has restored hope that there is at least a little sanity left! Congratulations on your new born. No your not seeing things, I thought it renamed the entire thing until I noticed it depends on which reply you click quote or reply to. 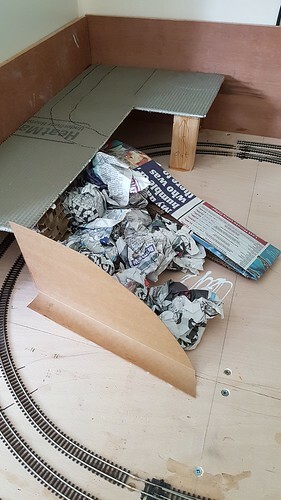 Thanks, I've just removed the masking tape from the tunnels, a few small touch ups and I think a bit of scatter could be in order at some point in the week. 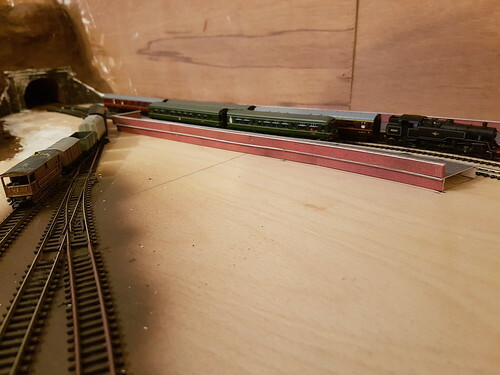 I removed the tape so I could run my new class 108 DMU in BR green. Oakford station up platform is now complete. On the non-ramp end it will have steps up to the ticket office in Oakford town itself. One side note, I'm not happy with Metcalfe not using the same colour on the pre-sticky patching paper as on the main platform top. Other than that in very happy. I will be making a pent roof shelter on the platform as well, just a little brick built thing, recessed into the corner where the platform gets narrower. Oakford now has an up and down platform. I have set a little scene to show a busy day at the towns station. The up platform has a small 3 coach train pulled by a Class 4MT standard tank engine, the down platform has a local service comprised of a 2 car Class 108 DMU. 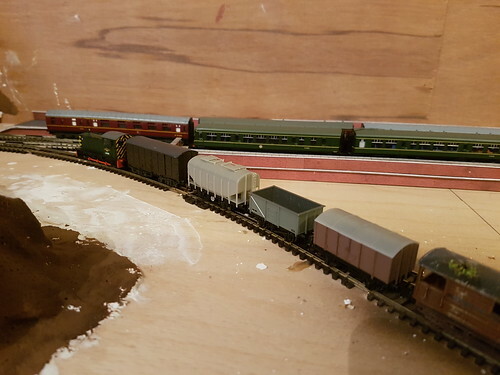 There is a mixed goods rake pulled by a Class 04 Diesel, waiting for the line to be clear before it can embark on its journey. 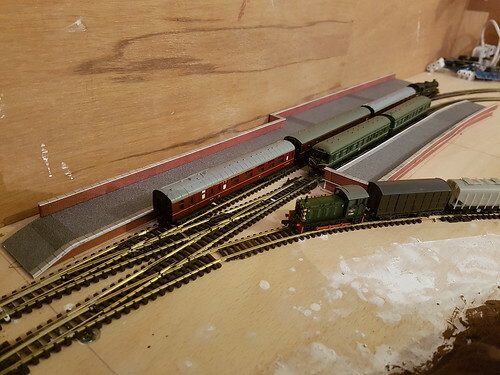 The platforms have added an extra dimension to the layout. 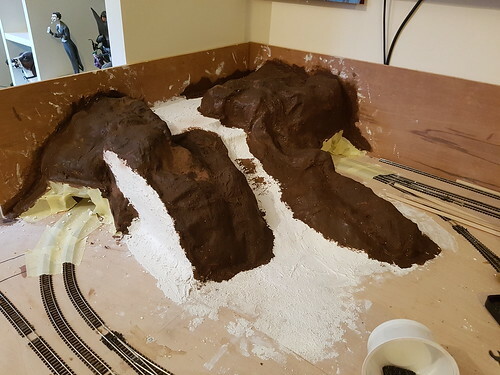 Next steps are track weathering and ballasting, BEFORE I build the second covered area which is where the town will be. Well a major decision time has come upon me. 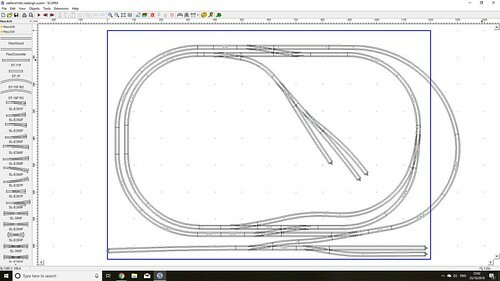 I am a bit concerned about mistakes I have made with track laying on this layout. Initially I was OK with the kinks and such on the track but these have become problematic. My points straight after a curve are causing me headaches with locos derailing. Rushing headlong into building my hillside and not putting any ballast in before that has caused problems since I have tried to ballast once the main hillside was in and the sections in the tunnel mouth has not ballasted well and is now causing problems for some locos to run over as they slow down if not stop entirely. 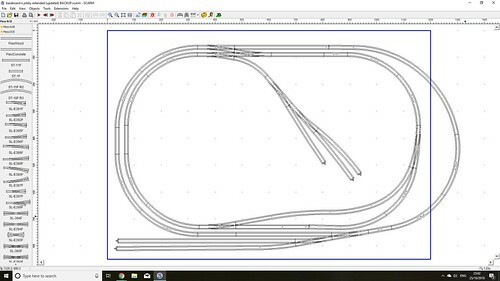 The 3 points at the top left of the layout are causing me no end of problems, they seem to be the main culprit of the issues, the inner track join to the point is where it has deformed and is just not connected properly at all. Some locos are fine with it but some of my rolling stock and locos just hate it. I also want to move the crossover further up as this will cause problems for me with point motors, not realising exactly how big the motors were when I designed the layout they would clash where the point are parallel with each other on opposing tracks. 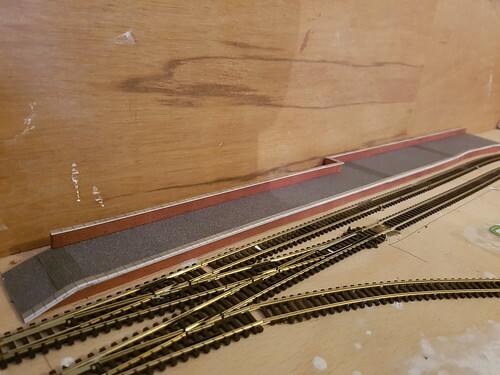 Also some joins are just causing problems as when trying to fit them I made a few mistakes on cutting so trimmed too many sleepers and now have had some loss of structural integrity to the track which has caused warped joins. I have done a slight redesign to the plan to allow for the points to sit away from the start of a curve, and also added in a way 'off' the inner loop back onto the outer one. After looking at the layout in front of me I could get away with the point on the inner loop that is going into the curve on the lower left as this seems to not have deformed at the join with the curve. The main thing I think holding me back is the fact I will have to remove the hillside. 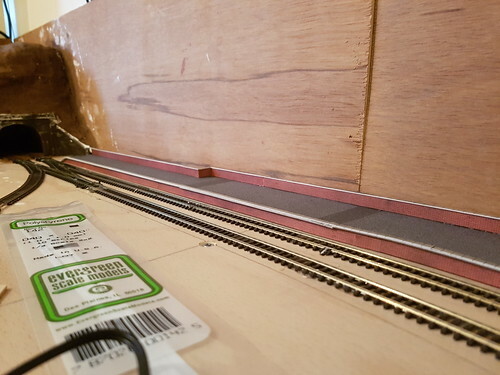 If I do this properly I could just pop it back on to the layout once the new track is laid. 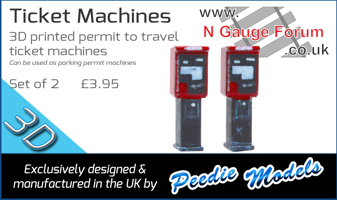 I think I have come to the decision that I will do this but I am still wary and after asking on the Facebook NGauge Forum group that a few people have already done this. Just after getting to this stage in 4 months I am now thinking of taking most of the track work out is kind of scary. Dont worry too much. I'm afraid that most of us have been there and that's how we learn! Chin up, as they say. You just have to grind on until the next problem sets you back again. I don't mean to be discouraging. It's solving these sorts of problems that makes it all interesting, or at least challenging. I think now that you’ve “decided” you’ll never be happy with the existing track now that you’ve highlighted the niggles. As Martin says, it’s all part of the fun! Don’t be discouraged just take it as a positive that you’re building a really good layout that you’ll enjoy for a long time!